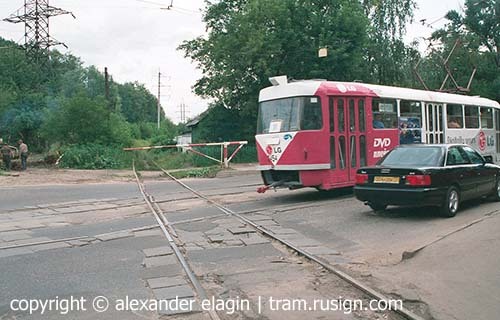 Moscow tram network has a number of level crossings with freight railway lines. All these lines are a low-traffic branches to various factories, and none of them is electrified today. A unique crossing in Simonovskiy Val. Here the railway branch crosses not only the tramway, but also a wide (6 rows) highway! This crossing is equipped with traffic lights and barriers (only on the highway; tramline has traffic lights but no barriers). 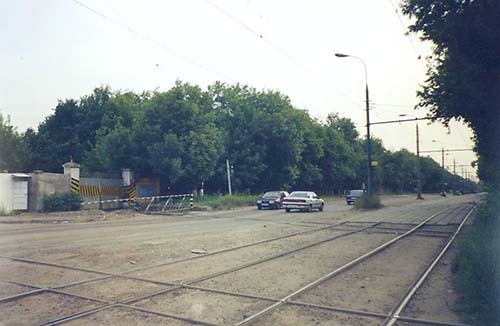 Another level crossing is located not far from the previous place on the same tram line. 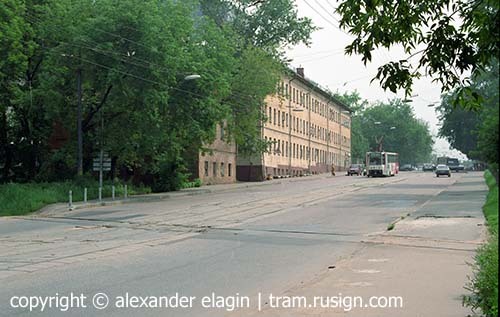 Here in Ugreshskaya Street tram tracks cross factory sidings with light freight traffic, therefore this crossing does not have any specific equipment except for the red signals. Photo by Denis Ivanov, scanned by Alexander Nabokov. Used with permission. Krasnobogatyrskaya Street and the railway branch serving the Krasniy Bogatyr factory. A very unusual manual-operated barrier can be found here: it can bar either railway or road. Izmailovskiy Val. This crossing today does not look well, but this railway branch once was served by electric (!) freight locomotives. 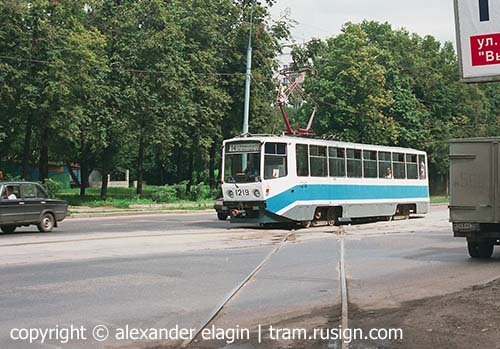 It was electrified with the same voltage (550 V DC) as the tramway, so no special measures were taken to separate the two overheads. As the heavy industry in Moscow still suffer from the economic collapse of 1990's, the freight traffic has drastically reduced. Because the overhead needed regular service, the factory decided to abandon the electric locos and today it uses diesels to move rare freight cars. 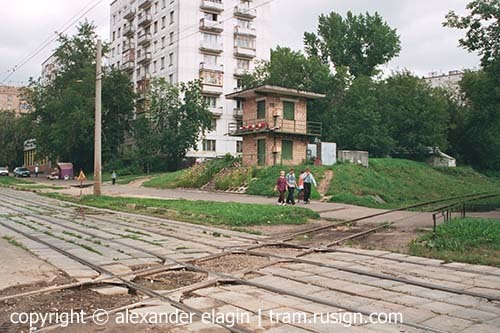 Dubininskaya Street once had a few railway crossings, but their number has decreased with years. Now only one level crossing is still in use, all others were dismantled. This photo displays one of the dismantled crossings; note the freight car beyond the gates. Volochaevskaya Street. This crossing is one of the best in Moscow, it has functioning traffic lights. Ordzhonikidze Street. 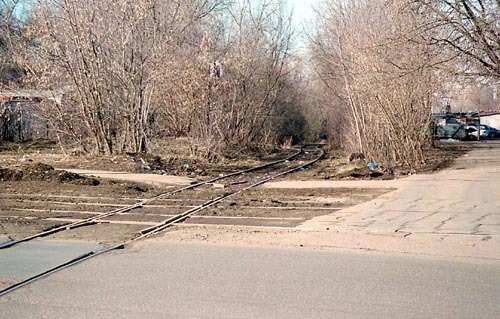 This railway branch was abandoned in mid-1990's, and the rails was removed in 1999-2000. 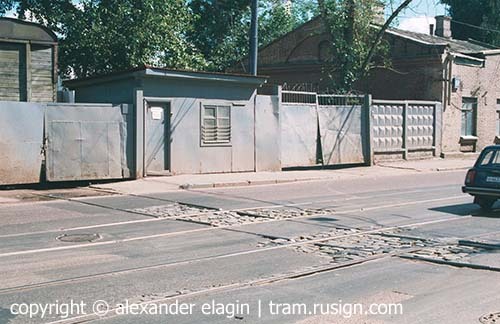 Just one section of the railway remained - this one, in the street, crossing the tramway tracks. Finally this short stretch was covered with asphalt (or removed), and in September of 2000 the street had only tram rails and no railway. 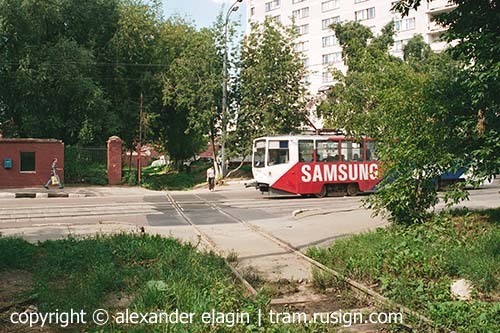 Skhodnenskaya Street in far north-western part of Moscow, where another freight railway branch crosses the tram tracks. Although the track looks a bit curved, this crossing is functioning, and it is equipped with warning signalling.